Try to get up in the morning and go to bed at the same time each day, even at weekends. You may need to set an alarm. Creating a sleep routine will help your body make the chemicals that control sleep. 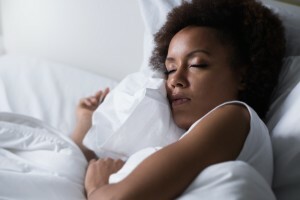 Having a sleep routine such as listening to soothing music or doing stretching or relaxation exercises before bed can also remind the body that it is time to slow down and sleep. Taking a warm bath before bed may help you to feel relaxed and sleepy, and try to avoid using your bedroom to watch television or work so that when you do go to bed, your body knows that it is time to sleep. Electronic devices such as televisions, tablets and computers produce a certain type of light called “blue light”. Blue light interferes with a chemical called melatonin which helps us sleep, and it can also reduce a type of sleep called slow-wave sleep which is essential for us to feel rested. Blue light during the day, especially in the mornings and after lunch can be useful because it can make us feel more alert, but if we have too much blue light before bedtime then sleep can be disturbed, so avoid using a computer for long periods or watching too much television just before bed. Getting more natural rather than artificial light by going outdoors as much as possible during the day can also help increase daytime alertness and improve sleep quality. Regular exercise, especially aerobic exercise which gets your heart beating faster, has been proven to improve the quality of sleep and just being more active during the day can also help improve sleep and fight fatigue. If you exercise too close to bedtime though, the exercise may make you feel more alert and this may disturb your sleep. Try to do some exercise in the early evening so that by bedtime you are ready to sleep. Many people who lie awake at night find that their minds are too active, for example thinking about worries, things that they need to remember or things that they have to do the following day. Some people also find that worrying about not sleeping then makes the problem worse. Clearing your mind is not easy but trying to be more relaxed about not sleeping can help. Try to concentrate on feeling calm and comfortable rather than thinking about getting to sleep. If a good idea is keeping you awake, keep a pad and pencil next to your bed and just write down the idea so that you can forget about it until the morning. Try some slow breathing and just concentrate on the action of breathing, perhaps counting your breaths as the air moves in and out or try some progressive muscle relaxation – tense and relax each part of your body in turn starting with the toes and working upwards. Try visualising a relaxing place such as a wood or beach. Learning meditation or mindfulness and cognitive behavioural therapy (CBT) may also help to calm your thoughts. If you are still awake after 15 minutes or so, try getting up and doing a light relaxing task such as having a warm drink, reading or listening to an audio book or quiet music then go back to bed when you feel sleepy again. Coffee, tea, cola, cocoa, chocolate and some medicines contain caffeine and other stimulants which can disturb sleep. The effects of caffeine can last for many hours in the body so consider switching to decaffeinated drinks or avoid caffeine apart from in the morning. Alcohol may help you feel sleepy at night, but overall it will interfere with the quality of your sleep and prevent you from feeling rested when you wake up. A heavy meal before bed or too much spicy food at night can make it difficult to sleep, so consider how much you eat before bed. Herbal tea or a milky drink may help you relax but don’t drink too much before bed as this may mean you have to wake to go to the toilet at night. Sleep quality can be improved by sleeping in a slightly cooler room—around 17C is comfortable for most people, so make sure that you have enough, but not too much bedding. Opening a window at night may help. If you are disturbed by noise at night, consider wearing ear plugs and if you are woken by daylight, try a blackout blind. If your sleep is disturbed at night, you may feel sleepy during the day, especially in the afternoon. If you fall asleep during the day, even a short nap can then disturb your sleep at night. If you have to have a short sleep, make sure that you go to bed and set an alarm clock so that you don’t sleep for too long – 15 to 20 minutes maximum, and not later than the early afternoon. If you find yourself dozing in the afternoons or evenings, try to get up and do something, perhaps go for a short walk or do something active to make you feel less sleepy. Daylight and or blue light from a tablet or computer can also increase alertness if you feel sleepy in the afternoon. In general, taking medicines for long periods to improve sleep is not a good idea and lifestyle changes are much more helpful. Although medicines that help us sleep, they are not useful for long periods because they can be addictive, can stop working after a few days, or affect sleep quality. Some prescription medicines can also affect sleep, such as some antidepressants, painkillers and betablockers, so it is worth discussing changing your medication with your GP if your tablets seem to be causing a problem.